A disguised Bruce Wayne sits for coffee with Selina Kyle. Bruce wants Selina to oversee his venture with the supervillains, and she acquiesces while telling him in no uncertain terms, that he cannot win against Regime Superman. Regime continues his battle with Doomsday, and they trade blows, with Doomsday hitting Regime hard enough that he lands in Gotham City. They continue to fight, with neither gaining advantage, while Bane looks on. Story - 1: Not even the donnybrook between Regime and Doomsday can get the numbers higher for this installment. If this was the rematch or perhaps even the first Elseworlds with a version of Superman and Doomsday going at it, then the parameters would surely be different. However, there have been several dust-ups between the two since the "Death of Superman" storyline, in comics and other media, and to see them punch each other around is pretty low-level... especially for an evil Superman who continuously reminds us that he's willing to do whatever it takes. What's more, he's abandoned Flash auspices of the criminals about him, and a "medical team" sent to help. Forget for a moment that the Flash should be dead, or that Regime could have knocked Doomsday into orbit, buying him enough time to sort out the Flash and the escapees, and ponder on how Doomsday arrived on Earth from orbit at all. 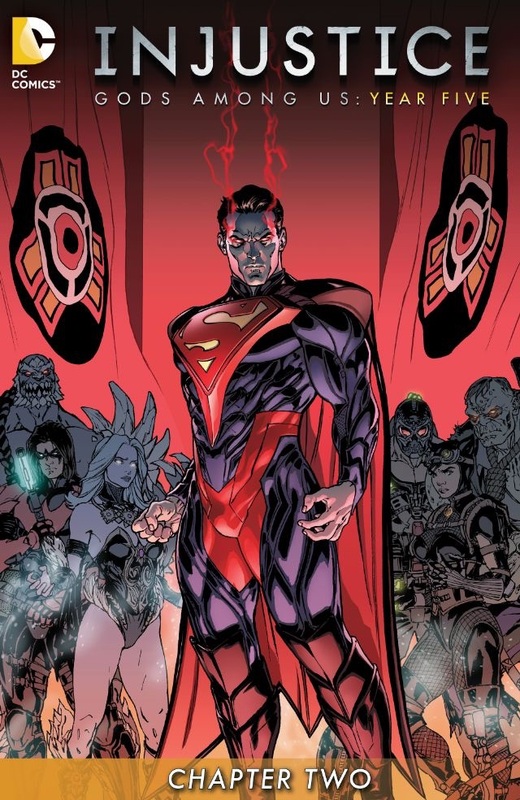 Add to that Doomsday's ability to follow Regime Superman to Gotham City, after knocking Regime sub-orbital, it is enough to consider that post-hypnotic suggestions are present in Injustice, gently compelling readers to not question any of it; just look at the pretty colors and imagine the big "THOOOOM" sound effect. Most of all, pay no attention to the man behind that curtain. He's playing the Injustice video game, and if you watch the cut-scenes, you'll realize how pointless all of this actually is. Year Five has rushed on the action with no thought behind it, not that Injustice could ever be held guilty of taking time to think about anything, and it's worse than threadbare at two issues in. Superman vs Doomsday has become worse than tiresome for me, it's become unwanted. Superman successfully defended Metropolis from Doomsday in Superman #75, Vol. 1, and the culmination of what battles followed was in Superman #175, Vol. 1. Jeph Loeb displayed a Superman who could confidently contend with Doomsday, and that was that. In order for Doomsday to pose any true threat, his ante would seriously have to be upped from that issue, and it hasn't been. Doomsday lives on the fumes of the past, and little has been done to make him gripping as a villain since Loeb handed him his walking papers. Doomsday, who was once a creature that tok the Man of Tomorrow to his limits, has become little more than a stock villain, which is a disappointment, as too many Superman villains tend to go that route. Mongul, Cyborg Superman, etc., were all promising adversaries for Superman, but became "bums of the month" through the combination of overuse and commonplace stories in conjunction. Few characters can survive such a compounding, and if they do, they become The Joker, who has to be shelved years at a time in order to remain effective. Is it any coincidence that a villain on its last legs finds it's way into a series looking for ways to stretch things out a wee longer? Art - 4: Coello's work is refreshing after too long an absence. He brought a great sense of fluidity and dynamism to Justice League Beyond 2.0... though he did have stiff competition.